Regiment/Catrawd: 'D' Company, 10th Battalion, Welsh Regiment. Service Rank and Number / Rheng gwasanaeth a rhif: Private No. 18144. 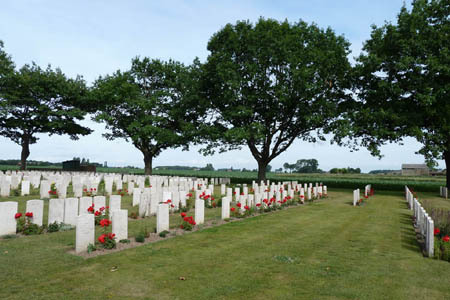 Military Cemetery/Memorial / Fynwent milwrol: Bard Cottage Cemetery, West-Vlaanderen. Ref No Grave or Memorial / Rhif cyfeirnod bedd: Plot: 11. Row: D. Grave: 17. Killed in action at Ypres, Belgium on Thursday 22 March 1917 aged 23 years. Benjamin Rees was born in Treorchy, Glamorgan, Wales on 12 May 1896. He was educated at Ynys Wen and Pentre Boy’s Higher Elementary School. The 1911 Census shows that the family lived at 28 Dumfries Street, Treorchy, Glamorgan. The head of the family was William Rees aged 50, who was employed as a Coal Miner. His wife Ann Rees aged 49 and their 10 (ten) children – Gwilym Rees aged 29, a Coal Miner, Gomer Rees aged 26, a Coal Miner, Lizzie May Rees aged 24, Mattie Rees aged 22, Howel Rees aged 18, a Coal Miner, Christina Rees aged 16, Benjamin Rees aged 14, a Colliery Lampman, Gertrude Rees aged 13, Blodwen Rees aged 12 and Lily May Rees aged 10 years. On Monday 12 October 1914, Benjamin enlisted with 10th Battalion, Welsh Regiment. On Thursday 11 March 1915, he married Freda May Thomas at All Saint’s Church, Chilcombe, Winchester and they lived at Lincoln House, Crescent Road, Rhyl, Flintshire, North Wales. On Tuesday 2 November 1915, Benjamin was posted to France and Flanders with the Battalion as part of the British Expeditionary Force. He was Killed in Action on 22 March 1917 at Ypres, Belgium. On the evening of Thursday 22 March 1917, His Platoon Commander Lieutenant Waterhouse Jones wrote to Mrs Freda Rees as follows:- ‘Your splendid husband was killed by my side this morning by a piece of shell, which hit him in the back. We of ‘D’ Company, all of us, Officers, NCO’s, and Men will feel his going very deeply. He was always so cheerful under all circumstances, and he died doing his duty, a splendid soldier’. Bard Cottage Cemetery, West-Vlaanderen, Belgium. On 7 June 1917, a payment of £2. 18s. 1d. was made by the War Office to Mrs Freda Rees, being monies owed to her husband Benjamin. On 20 November 1919, a further payment which is recorded as a War Gratuity of £11. 0s. 0d. was also made to her. Benjamin Rees is also remembered on a Remembrance Plaque at The Royal Alexandra Hospital, Marine Drive, Rhyl, Flintshire and on The North Wales Heroes Memorial Arch, Deiniol Road, Bangor, North Wales. There is a Flintshire Roll of Honour Card for him at the County Archives, Hawarden, Flintshire, which is dated 16 October 1919 and signed R. Owen.